Powered by a lightweight, rugged "industrial engine," the 8.0 EGTD continues to support the strong record of reliability Westerbeke has built supplying product to the United States Navy and Coast Guard as well as commercial vessels and pleasure craft world–wide. The 8.0 EGTD's robust 1.32 liter engine provides additional capacity to manage some momentary motor loads that may "bog down" similar generator sets limited by engine power. The 8.0 EGTD provides 3–cylinder smoothness and a tuned air intake silencer for quiet, slow speed operation. In addition, standard electronic governing maintains the engine at a constant speed virtually eliminating "droop" when load is applied. The engine operates at a low 1800–rpm and is fresh water cooled, via heat exchanger, for longevity. The generator windings are NEMA class "H" insulated and double vacuum epoxy impregnated to increase protection against the harsh marine environment. Easy access servicing points and individually removable top and side panels of the optional sound enclosure contribute to easier maintenance. A customer sourced, electric clutch and hydraulic pump can be mounted to the full torque, power take– off interface for use with such items as bow or stern thrusters, compressors, winches and emergency "get home" systems. 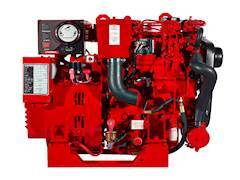 This generator set is backed by Westerbeke's 5–year limited warranty. The presence of Westerbeke in over 65 countries around the world provides customers with easy access to parts, service and technical support word–wide. Established in 1937, Westerbeke is committed to providing its customers with quality products and unequaled after sales support. The optional Sound Guard SST enclosure provides optimum silencing for the generator. Ruggedly constructed with stainless steel base, frame and powder coated aluminum panels; the Sound Guard SST also provides optimum corrosion resistance. All 5 panels are removable for easy servicing and maintenance.